Clean up your Microsoft Outlook from duplicate items in no time. Remove duplicates with just one mouse click. Search and remove (or merge) all types of duplicates. Customize the search to accurately find every duplicate. 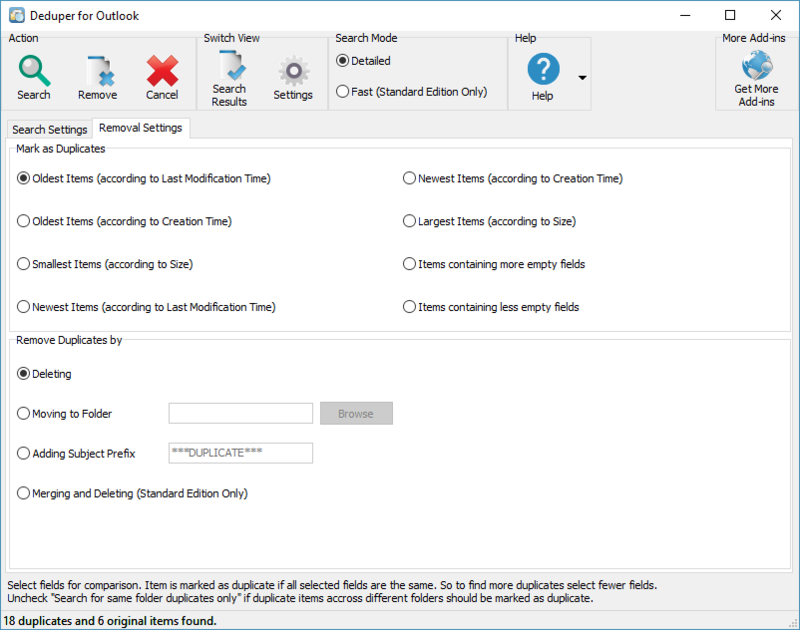 Get Deduper and remove Outlook duplicates quickly and easily. 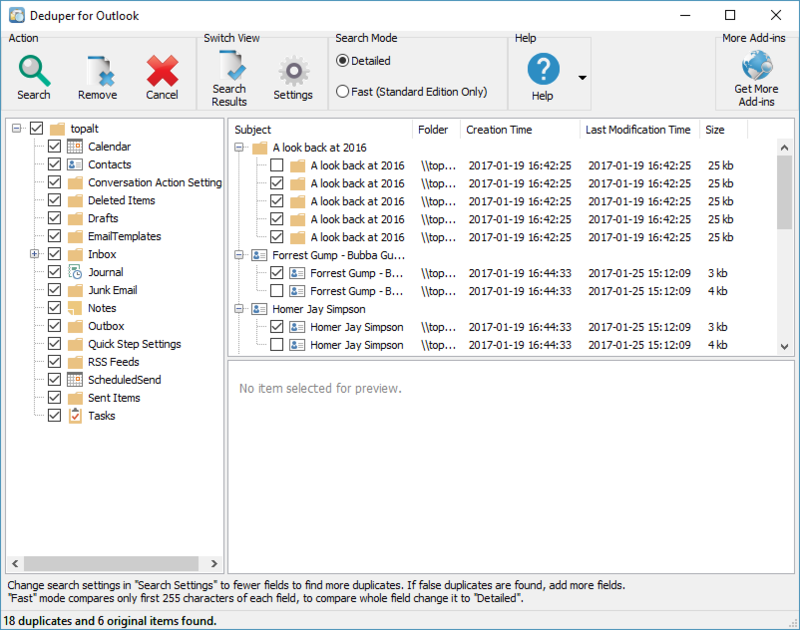 Deduper - Outlook duplicate remover does exactly as the name suggests, it searches and removes all duplicates; whether that's appointments, contacts, notes, tasks or emails. It can find thousands of items in one instance, and you have the ability to manually check everything that has been detected, in which you can cancel or delete or move the item. Deduper completely eliminates the need to manually delete duplicates in favor of a completely automated system for novices and experts - it doesn't matter your skill level because we combine advanced features with a simple UI. Deduper is the easy way to remove duplicates in Outlook. Remove duplicate emails in Outlook. 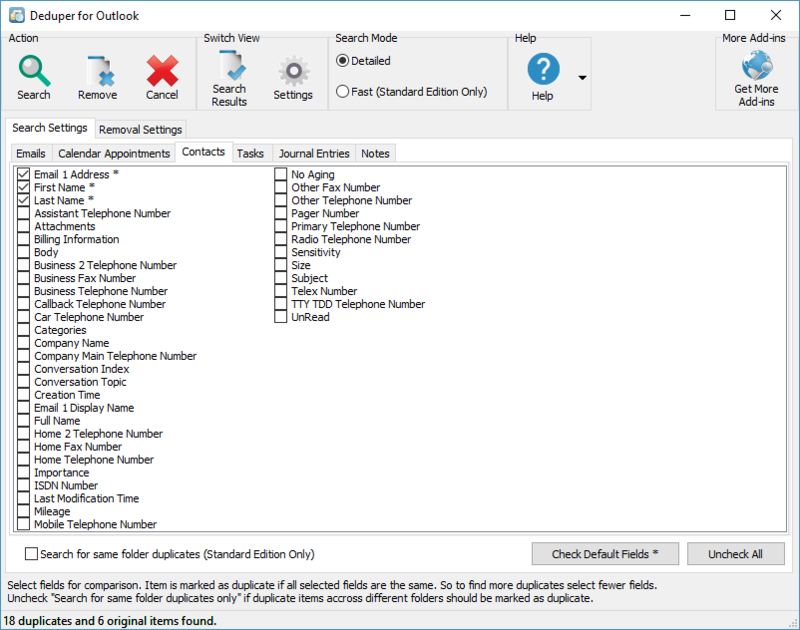 Merge duplicate contacts in Outlook. Delete duplicate calendars in Outlook. Do not lose any important data, merge duplicate contacts and other types of items (emails or calendar). Allows previewing duplicated items before removing them. Allows customizing scanning options for duplicated data detection to fit every situation. Has multiple ways of dealing with duplicate items (delete duplicates in Outlook, move to another folder, merge duplicates or add subject prefix). Can search across the folders. Works with all types of folders (emails (messages), calendar, contacts, journal, notes, and tasks). You can try Deduper for free. "The product did what it said it will do, and did it fast. I had 10 GB of data, and I managed to remove 6000 e-mails in under an hour. The filters are great, and search worked mostly in under 1 min. Well done"
"Worked great. I had so many duplicates. What I really liked is everything went into the deleted items folder, so I had a chance to look it over and make sure nothing was deleted that I needed." "Thanks for a fantastic product. I removed 112,261 duplicate through to centuplicate emails in one session. Settings were easy to understand and apply. Nice to be rid of so much excess baggage. This is an invaluable tool."